If we honestly explore the question of “who we are” using empirical evidence as the foundation, we must first acknowledge that in general terms, we don’t know too much. Our development of collective self-awareness thus far includes the intellectual baggage of the sort that typically stems from isolated observations. In a broad sense, our perspective is like the person observing the sun go up in the morning and go down in the evening with no other perspective to lend vision to the deeper nature of the relationship between the earth and the sun. To make sense of the world based on limited perspective carries with it inherent hazards. Because of this, we should have a healthy mistrust of conclusions that seem obvious even if they are based on the finest of observational foundations because of the inherent flaws that emerge due to a limited perspective. Even more than recognizing some of the more obvious shortcomings in our current array of self-knowledge, what we think we know using solid evidence as the basis should be highly suspect if we honestly factor in how our biases can so easily warp our thinking. Confirmation bias for instance can easily turn our perceptions into a self-congratulatory, albeit delusional parade of verbal vanities. Sincerity and self-assurance is no guarantee of accuracy. Some of the ideological currency in circulation propose to explain who we are using a partially or totally mystical, “revealed truth” idea base. While these ideas can imply a foundation for what we can or should be doing or not doing, in order to buy into them as true we must be willing to accept abstractions such as authority or tradition as truth at the same time we diminish or suspend hard evidence. Because some of these ideas are so culturally pervasive, they can sometimes masquerade as mere social convention and be absorbed and treated as de facto truth without ever being questioned. Mystic perspectives can provide those that hold them with a certain confidence and/or hope in what is otherwise an undefined and perhaps frightful view of the reality of the human condition, but they can also hide assumptions that are insidiously destructive at the same time they produce this false confidence. We need to be mindful of the fact that certainty has never been a guarantee of accuracy. Before any of us who sincerely believe we espouse a reasoned approach to life fly too close to the sun with wax wings we should caution ourselves that there is a difference between the refutation of an irrational argument and the actual presentation of a reasoned alternative. This second aspect, that of presenting a reasoned alternative, appears noticeably absent in the current cacophony of public debate on reason vs. faith. Because of this, a reasoned response is what is being attempted here. Assuming we steer clear of all things mystical we still must contend with the powerful influence of bias in order to attempt a clear view of ourselves. Because of the inherent flaws in our perceptive capacity due to our inability to spot and segregate our personal biases from actual evidence, a strictly pragmatic and empirical approach to the question of who we are must not venture too far into the mushy pockmarked fields of meaning and purpose, but be confined to a simple set of rather obvious facts. This is not to say that meaning and purpose are not worth exploring, just that this is not the topic at hand. Our notorious capacity to “fill in the blanks” in our limited vision with theological duct tape is very handy as a survival skill if we need to quickly assess a potentially dangerous situation. In certain cases, our capacity for inductive vision well suited to compensate for the limitations of our senses to absorb a complete picture. We run into trouble when this same capacity to fill in the blanks is applied to things where the value of the information can only be extracted if we have a clear view. When this occurs, it is quite possible to strip both the usefulness and the effectiveness out of our ability to intentionally shape our experience of life. A deeply held conviction about the Great Pumpkin might be socially admirable depending on the culture, but it is unlikely to result in many toys on Halloween. Quite often we fill in the blanks out of fear, unquestioning acceptance of cultural conventions, the need to belong or some other factor. This moves our capacity to perceive from a potentially useful tool with which to navigate to a potentially destructive generator and perpetuator of poverty. In order for vision to be useful, what we perceive must serve as an accurate explanatory force in relation to the behaviors that contribute to, or discourage the relationships that lead to our fulfillment. The lens through which we see can serve as a means to shape our experience in purposeful and satisfying ways, or it can range in power from ineffective to destructive. To effectively cultivate a satisfying experience of life, raw sensory perception must be coupled with the ability to synthesize information into effective courses of action in the context of our needs. To do this requires that we take more than a casual approach to understanding our needs and our capacities to meet them. We must understand how to align our collective information processing skills and behaviors to the task of influencing the environment in intentional ways to satisfy our biological state of being. This state of awareness must include an understanding of who we are, the context in which we exist and how well this relational environment is suited to or toxic toward cultivating our full potential. To cultivate clear and useful vision we must have a standard that reliably communicates what it is that actually fulfills us and evaluate the nature of the filters we place on raw sensory data against this standard. This can be a difficult task with so many competing standards currently in circulation. Biology is what we will use here as the lens through which we establish the foundation of who we are. As a biological organism, we are composed of complex interactive, interdependent structural systems that are built on what are by comparison concentric rings of comparatively less complex relational systems. Assuming an ideal healthy state of being, the principle of mutually beneficial relationships between elements of structure is at the heart of what we are. Unless our heart provides a valuable behavioral function to the rest of the body, and the rest of the body does the same with respect to the heart, the integrity of the system breaks down. This simple empirical observation can tell us a lot about who we are. For instance; when we consider the mutually nourishing relational systems on which we depend for existence, it explains why we never see anyone who is both excessively selfish and satisfied at the same time. The reason for this is plain: it violates the relational dynamic that cultivates our full potential. In effect, when we behave in ways that dominate our living peers, we generate a hunger for balance that we experience as dissatisfaction. This also explains why the most satisfied and fulfilled among us serve something greater than themselves, while seeing to their own needs. It is not an either or situation, it is both to nourish and to be nourished in the context of what satisfies the larger body of life of which we are part. This is why becoming a parent is often so powerfully transformative in the lives of those who experience it. It deepens our perspective of who we truly are. I hope you find this a valuable contribution to the value of what we know. Most of us ride the currents of values instilled in us through our environment. These forces, already in motion at the time we are born, are the substance of what we see as our identity… they shape how we see ourselves and the world around us — but is it really fair to say that we are these things which were installed by our culture and circumstance? Is it possible to see through the veil of cultural ideologies and make genuine choices that are not merely a reflection of the notions we were exposed to? The answer is yes, but not without enormous effort. Most of us don’t even recognize the fog we’re in. We see ourselves as self-aware and quite capable of free-will decision making when this is not the case for many of us. The definition of what is acceptable and unacceptable behavior differs wildly from one culture to another. Males of the Murut tribe of northern Borneo once sincerely believed that cutting the head off an individual was a natural and acceptable part of the preparation for marriage. As part of the culture, some of the men carried decorated baskets in which to put the head they planned to cut off. Different headhunter tribes of Borneo and other places had different beliefs and rituals surrounding the practice of severing heads. Some communities on the Upper Fly River of Papua New Guinea also practiced cannibalism. Some tribes held other beliefs such as those that considered the jawbone a protection charm. Some cultures used headhunting as part of a naming ritual for the children that were born into the tribal community. The practice of headhunting in Borneo was largely abandoned as of the late 20th century because of influences from other cultures. The main point here is that behaviors are viewed in the context of how they are valued within a specific culture. Behaviors that are seen as horrendous in one culture can be viewed as justified, admirable, natural, and otherwise having high value within another culture. What we come to accept, expect and value is powerfully influenced by the relational environment we develop in. This development of cultural norms effect takes place in large scales in communities, nations and regions and on smaller scales in families, intimate relationships and on personal levels. The adoption of values, even destructive ones as “normal” and “acceptable” is not a unique phenomenon among tribal cultures. It is in fact common to us all. In some cultures dogs are viewed as companions, in other cultures they are viewed as food. Once a specific practice such as the consumption of dogs as food is established, efforts to ban it by other cultures can be viewed as an “attack” on the culture. It is possible to be horrified at the practices of certain Japanese soldiers, headhunters or those that eat dogs because of cultural bias while at the same time ignoring very similar behaviors practiced within one’s local culture. Social acceptance of behaviors is applied to what would otherwise be viewed as savage or immoral simply because they take place within the context of what we become accustomed to. Some cultures perform live vivisections on animals for the purpose of medical or product research, education and so on. Still other forms of live dissection, decapitations and other forms of execution without anesthesia are performed, not for research, but for food or as punishment. In some cases industrial farm chickens are raised in concentrated quarters, crated and shipped to slaughter houses where they are shackled by the feet, semi paralyzed in an electrified salt water solution as their heads are dunked in upside down. The chicken’s necks are slashed, they are sent through a bleed out tunnel alive, (so the heart continues to pump blood as they die) then they are dipped in semi scalding water. Some of the chickens flail in agony so much during this process that they have been reported to have “broken bones and disfigured and missing body parts because they’ve struggled so much in the tank”. Many of us happily feast on the dismembered carcasses of this “product” of what might be considered low quality living conditions followed by brutal slaughter, as part of what we simply consider a balanced diet. It is not uncommon in cultures acclimated to this practice to accept it without much thought for the creature, or the fate it suffered. Advertisers will produce images of the dismembered corpses adorned with colorful garnishes and prominently place these images in public view. The acceptance of rituals and beliefs associated with cultures that embrace factory farming is viewed as cruel and appalling by a certain subset of vegan culture and animal rights activists, among others. The acceptance or rejection of behaviors within any given culture is defined by the standards for truth within that culture. Our standards for truth are often built on past and present accidents of association that influence our individual and group identity. This standard of tradition as the legitimizing factor for what we see as truth is not reliable with respect to what nourishes us to our fullest potential. If we do not question the enculturation process by which we acquire values and behaviors that are deemed appropriate in our local culture we may be limited to the experiences driven by those values. In the absence of vision that transcends our developmental environment we become slaves to the experiences spawned by this lack of vision. What we see as true is the foundation for how we value the events that we are exposed to. These values influence our experience of life. Sometimes the standards we use for truth amount to longstanding misinterpretations of how life is actually nourished and satisfied to its full potential. These interpretations and their subsequent behaviors may or may not have a causal relationship to what actually satisfies us. It does not matter if we sincerely believe, and passionately defend our perspective; reality sets the standard for how relationships contribute to our experience of life. Without a serious probing of the environmental values that have shaped our world view these forces will drive our experience of life and we will have no real freedom. 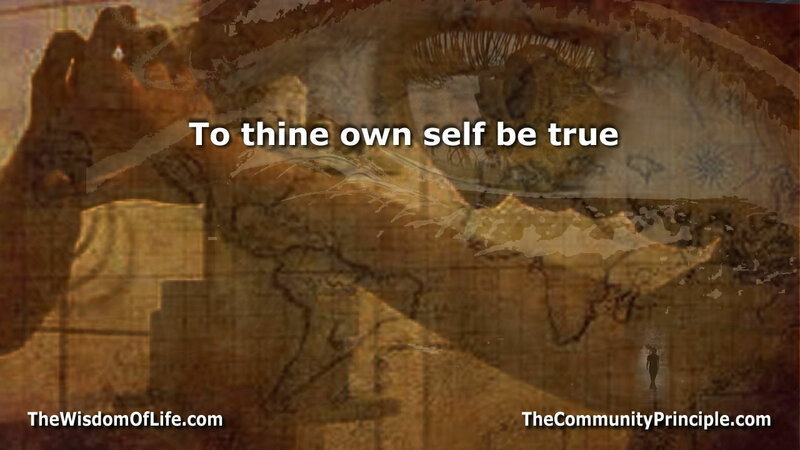 The quote “To thine own self be true” from Shakespeare’s Hamlet may sound like good advice. After all, with accurate self-awareness we can make effective choices that shape our experiences. Without self-aware vision we are trapped in a prison that amounts to being a spectator in our own lives. A misshapen view of ourselves can be just as destructive as blindness, if not worse. Delusion is an inseparable companion to chaos, stagnation and poverty when it comes to intentionally shaping what it is we experience as life. While the benefits of self-awareness are clear and arguably crucial to understand our roles so we can navigate toward anything satisfying and meaningful, as a society and even as a global culture we place little emphasis on self-understanding as a value. Perhaps the reason lies in the fact that in order to actually realize a reasonable understanding of ourselves we have to first understand the foundations on which our perceptions stand and this is an enormous task. The effort is especially hard to accomplish in the context of an apathetic culture because of how much we must swim against the currents of apathy. Most of us do not apply ourselves to this task with anywhere near the intellectual energy required to actually make any substantive inroads toward knowing ourselves. Using behaviors as indicators of our values we place a much higher value on glittery myopic distractions that ultimately drain us of purpose rather than nourish. There is perhaps a perverse irony in knowing the value of self-awareness because at the same time it presents a clear picture of how we can cultivate a purposeful existence; it convicts us of our own complicity in being buffeted by the winds generated by accidents of circumstance rather than captains able to harness circumstance to intentionally sail toward a destination of our own choosing. Perhaps an even deeper irony is how much effort it takes to become aware, much less exercise a measure of freedom.